The horizontal support and resistance lines placed on a price chart are known as pivot points. The prices which are placed are calculated from previous periods price data. For instance, the previous day’s data is used by daily pivot points. They are critical for traders, as these are prices which they use for entry and exit. The support and resistance are strong as it is used by banks, financial institutions and traders. Pivot points are support and resistance lines which are plotted on our chart automatically. Daily and weekly pivot points are the commonly used when compared to monthly pivot points. How do we use pivot points? Each level of pivot points can be used for support or resistance. For instance, the level R1 will usually be a strong resistance level. It is to be noted that, if the price breaks through and returns, it will also be a strong support level. The more pivots that line up, the greater the potential will be for price to react those levels. It is a general opinion that, if the price is below the main pivot point, it is assumed to be a negative response and vice versa if it’s above the main pivot point. There is durability in numbers. Hence the more queue of pivots ensures higher probability for price to react at those levels. For instance, if a weekly and a daily pivot point are at the same price level, this will ensure considerable support or resistance level. The different types of pivot points spin around the main pivot point or daily pivot. Once the calculation of the main pivot is done, this is then used to calculate the other successive pivots points. The pivot points above the daily pivot are termed as resistance pivots, notably R1, R2, etc. If they are below, they are support pivots, termed as S1, S2, etc. Pivot points that are between the pivots points are call mid-pivots. The mid-pivot between the S1 and S2 is termed as M1. 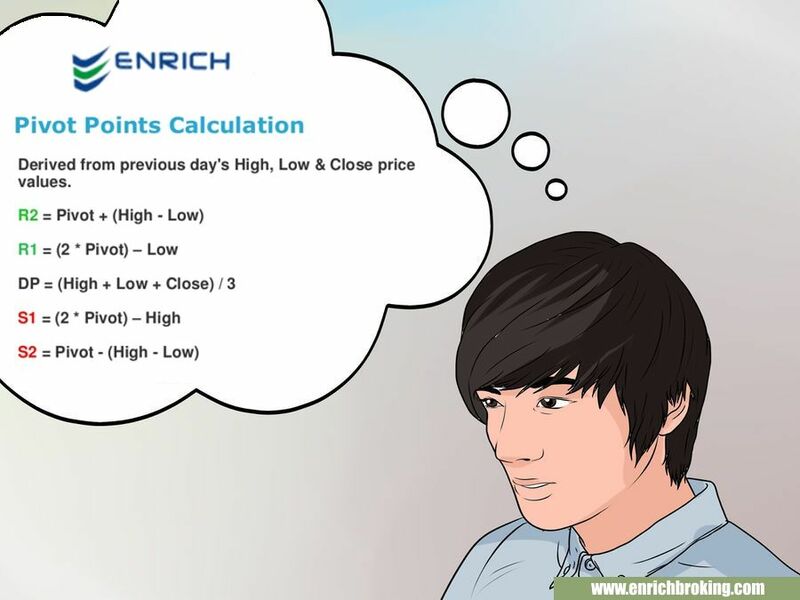 When a price is mentioned in the calculation, it indicates to the price of the previous period. For instance, the closing price is the previous day’s closing price. The daily pivot point is the main pivot point. All the other levels (R1,S1, etc) spin around this. Trading platforms possess tools to calculate pivot points. The charting packages help with automated calculations. For instance, Forex market operates 24 hours. Henceforth finding the closing price is not easy. We need to be consistent with our data by observing the same closing session. The stock exchange is different, as it has well defined closing time. Henceforth the closing price can be determined. The forex market has no open and closing times during the week for the market. We need to choose the trading session we wish to use for the closing price. Weekly calculations:Take OPEN – Sunday night’s session. CLOSE – Friday. Monthly calculations:Take OPEN from first day of the month. CLOSE – The last day. Subsequent pivot point is calculated from the main pivot point.